CORRECTION (3:53pm): This is actually a reference to Rhonda Cox, an associate producer at Blizzard. We apologize for the error. She’s OK with the comparison, though! We already knew UFC fighter Ronda Rousey plays World of Warcraft sometimes (as a Night Elf Hunter), and the fact that the folks at Blizzard love easter eggs, so seeing a small in-game tribute to her is really no surprise. But it’s still pretty cool! 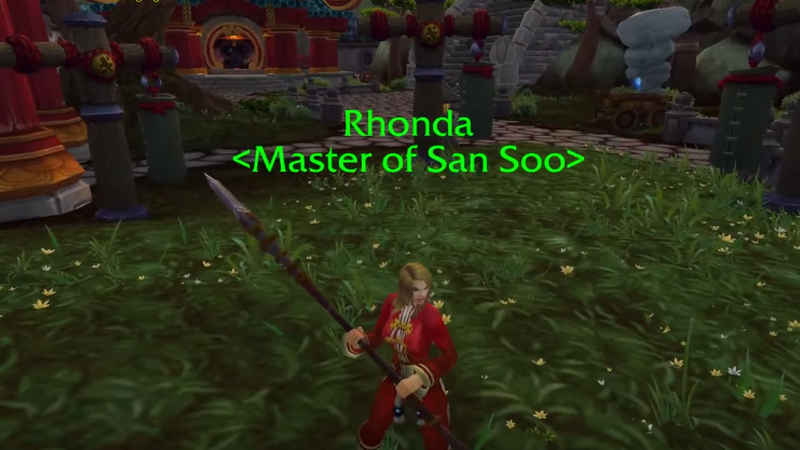 Her in-game alter ego is a human Monk, called Rhonda, and she’s hanging around the alpha build’s Monk Class Hall. Can’t miss her. Blizzplanet’s clip shows her exact location and features another in-game version of a famous WoW player: Mina Kunis a.k.a. Mila Kunis. This character was already in the game though, as a Garrison follower, she just moved to a new location in Legion.